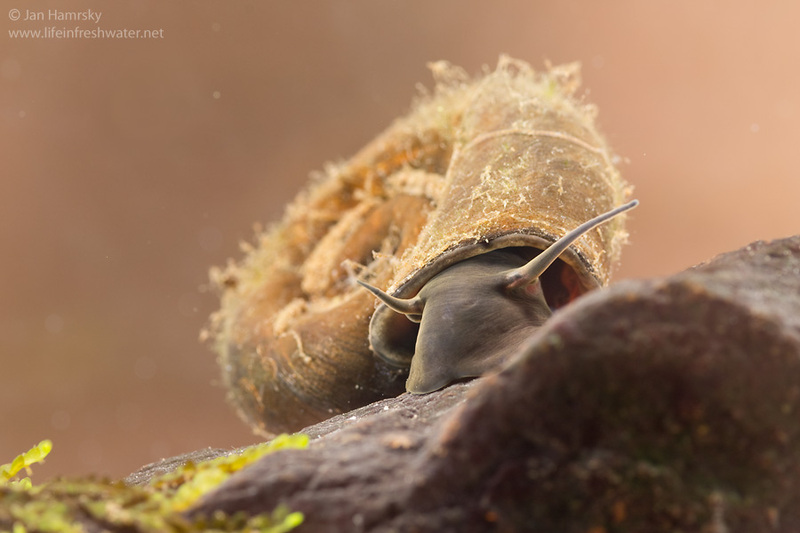 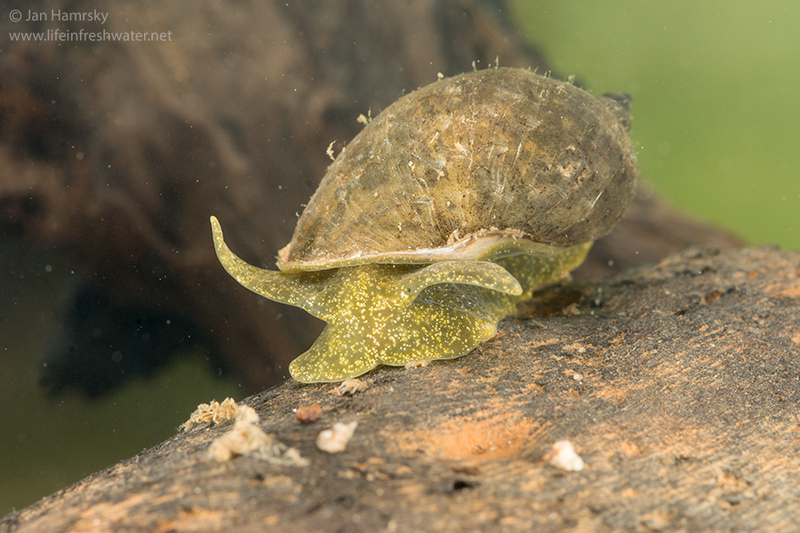 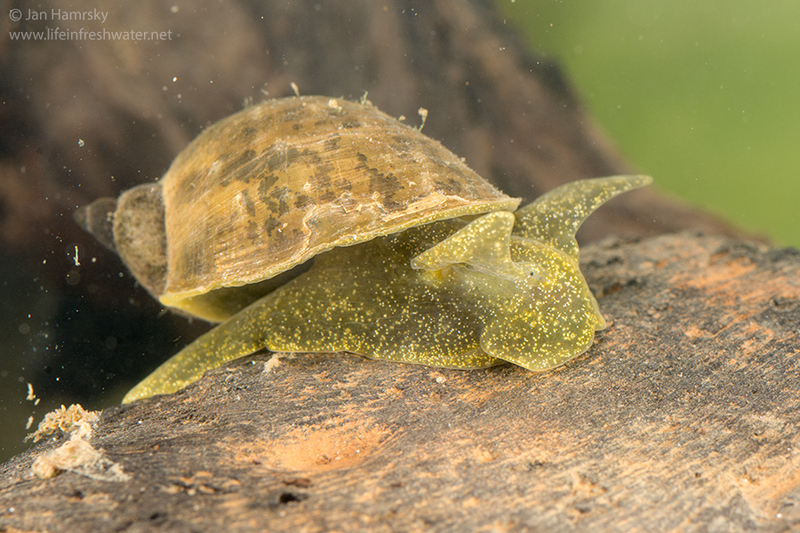 Scrapers/gatherers/shredders – freshwater snails mostly scrap the algae, gather fine detritus, or shred pieces of plant material. 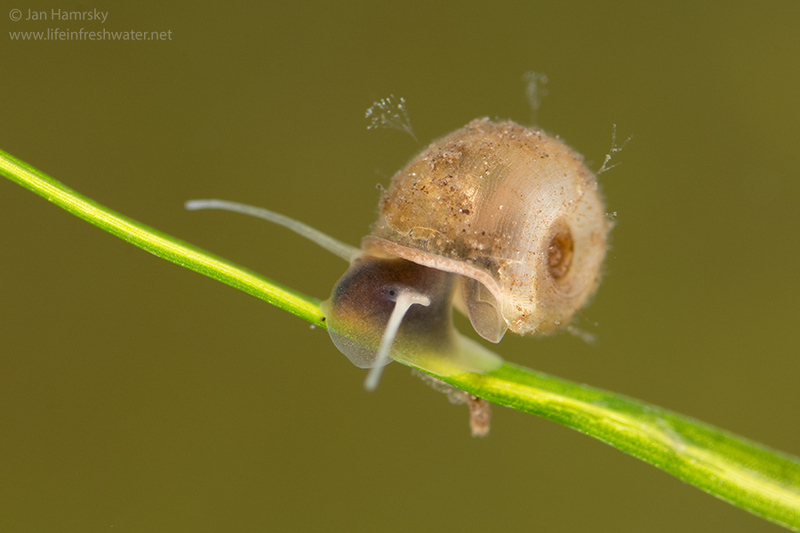 Snails occasionally ingest small misfortune animals that did not manage to get out of their way. 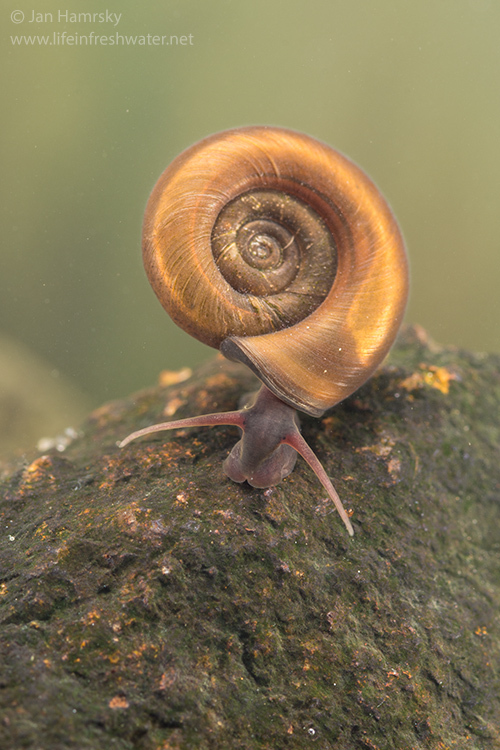 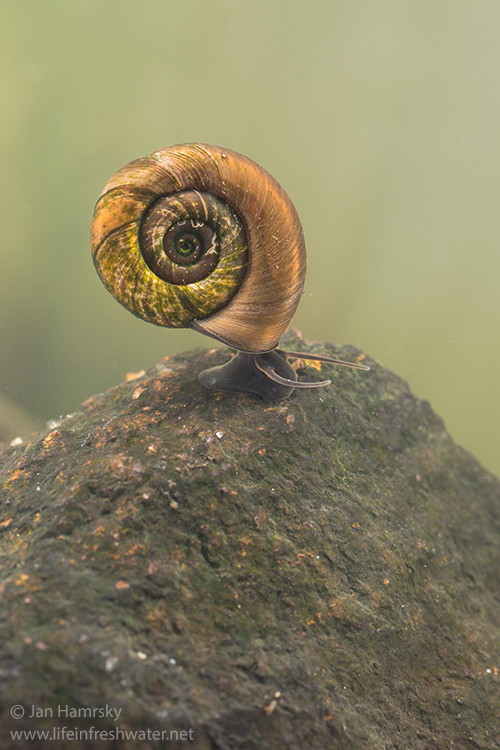 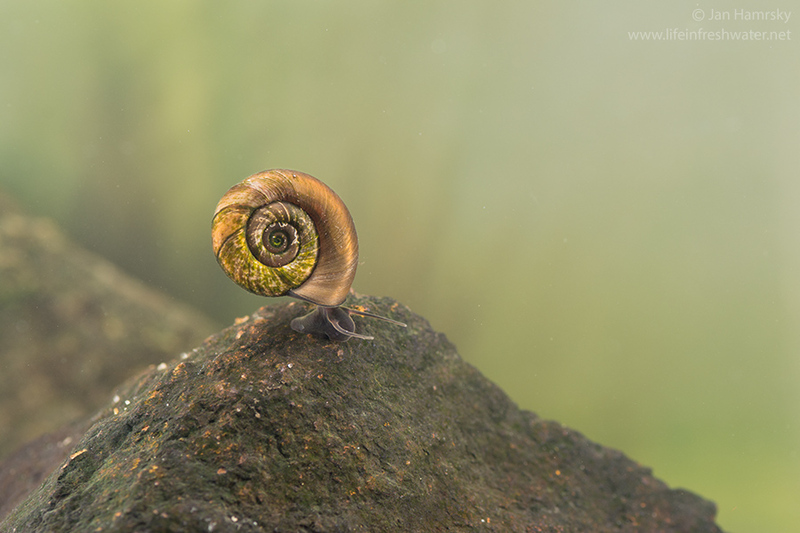 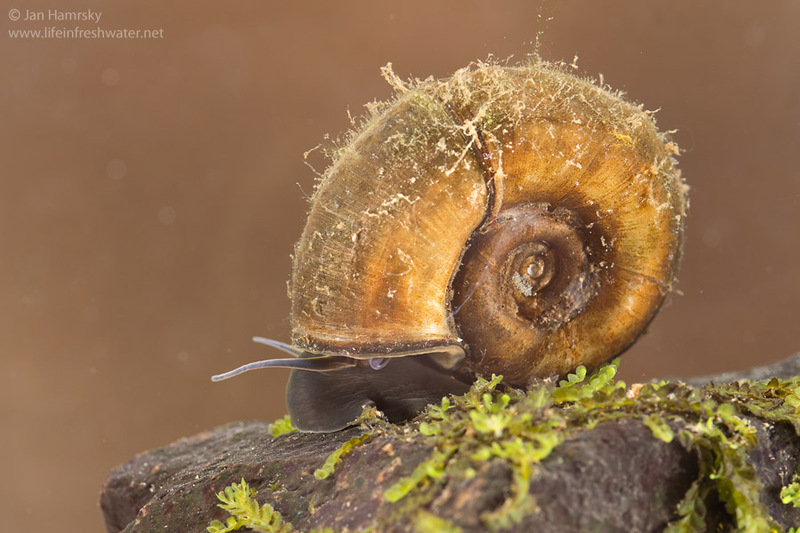 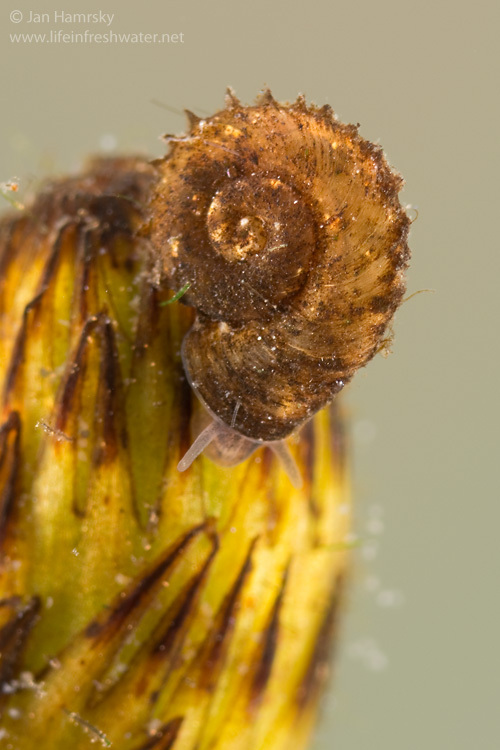 Snails can be found in almost all types of freshwater habitats from small ponds and streams to large lakes and rivers. 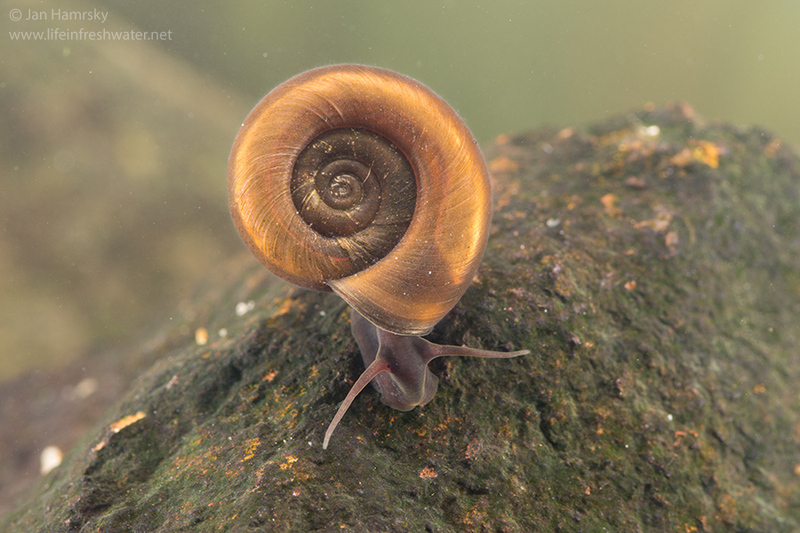 They are less common in the fastest and turbulent parts of flowing waters. 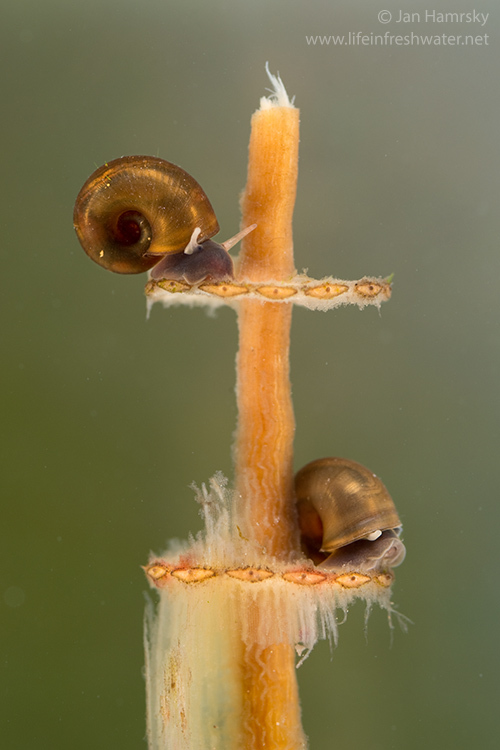 The ability of snails to firmly adhere to a solid surface makes them efficient clingers. 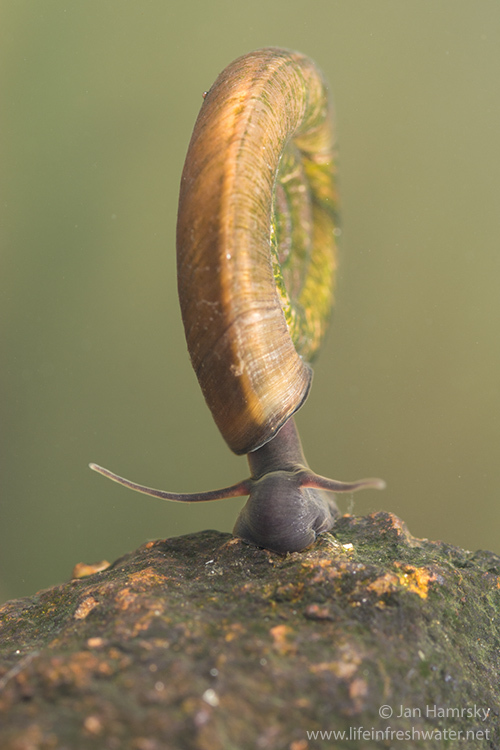 Some kinds are sprawlers, using a large muscular foot to spread their weight and glide on the layer of fine sediments. 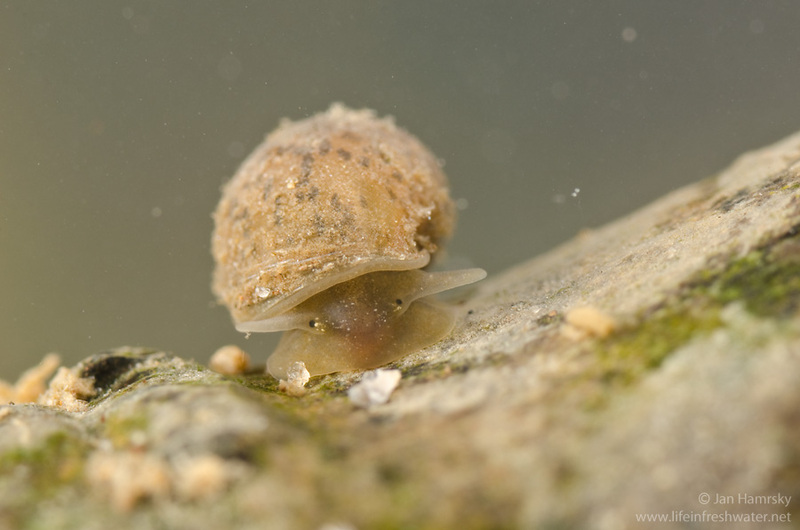 The size of adult freshwater snails varies among the species from 2 mm to approximately 60 mm. 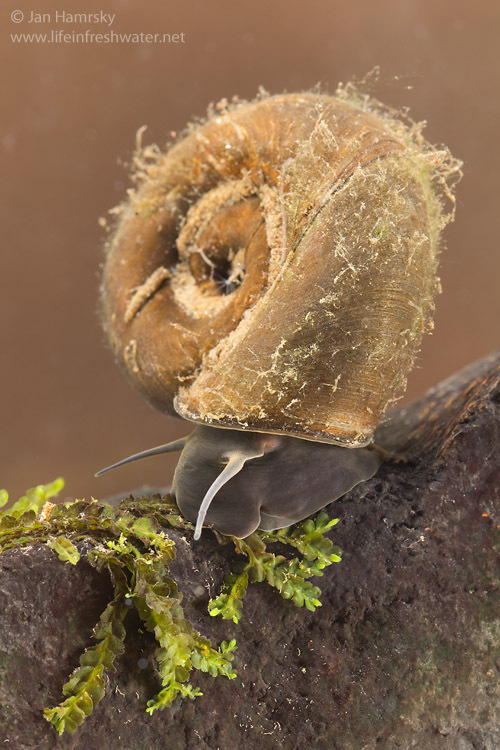 Snails do not undergo any conspicuous metamorphosis as they grow and develop. 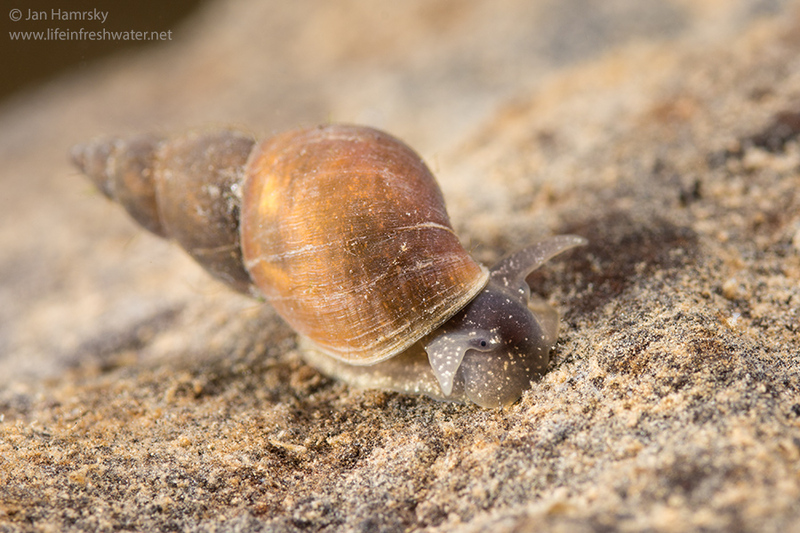 Juveniles look much like their adults with small and less coiled shells. 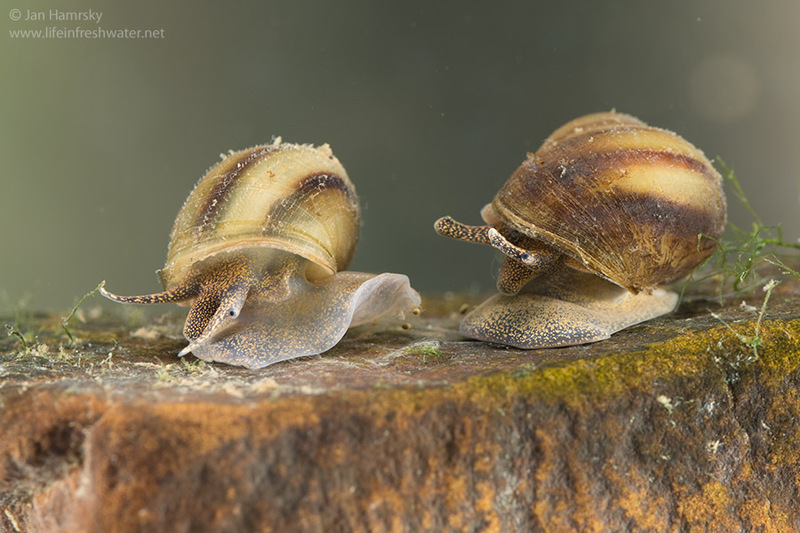 Lunged snails live about one year, while gilled snails live up to several years. 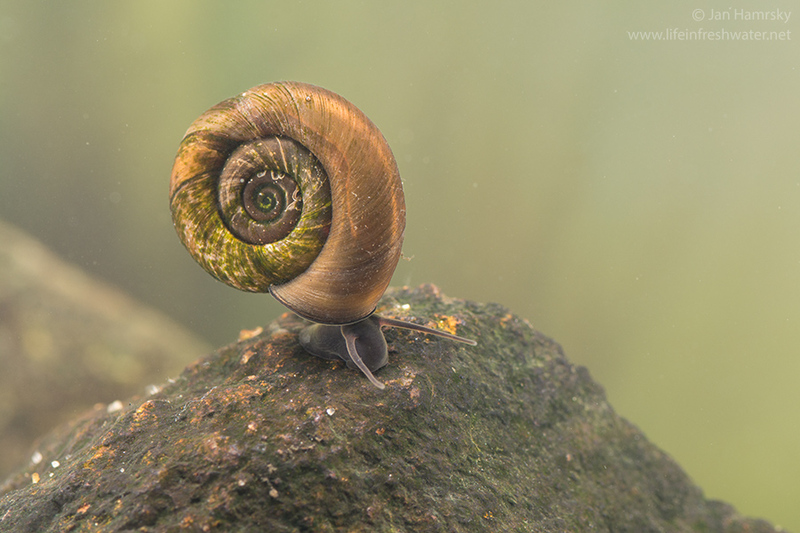 Freshwater snails usually produce several generations per year. 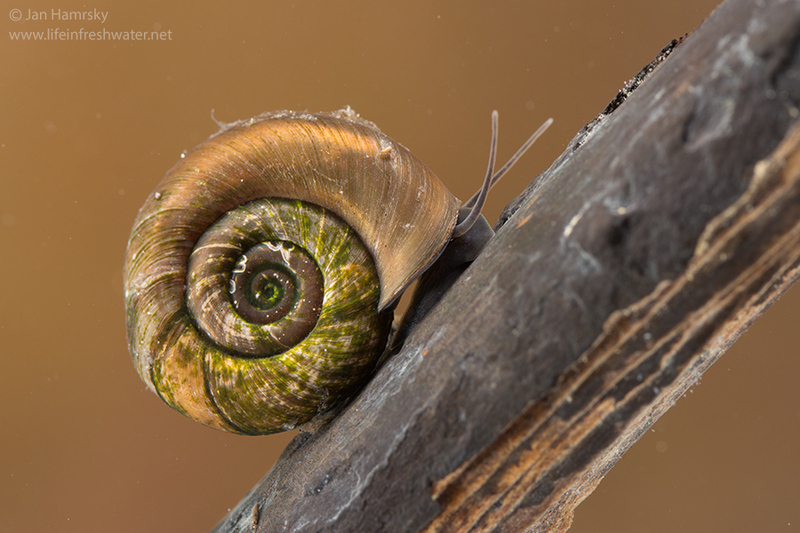 The most obvious characteristic of snails is their single shell, which is mostly spirally coiled and elongated. 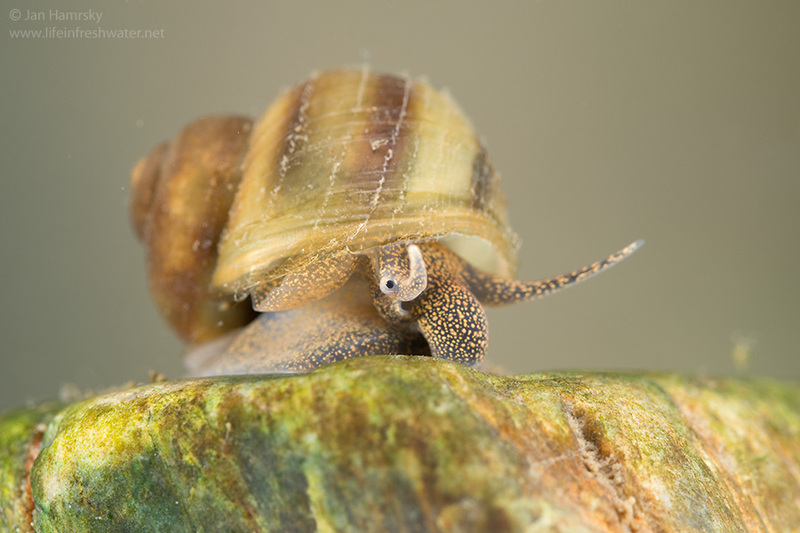 Hard shell (composed of calcium carbonate and protein) serves as exoskeleton for muscle attachment and protects the soft body from mechanical damage and predators. 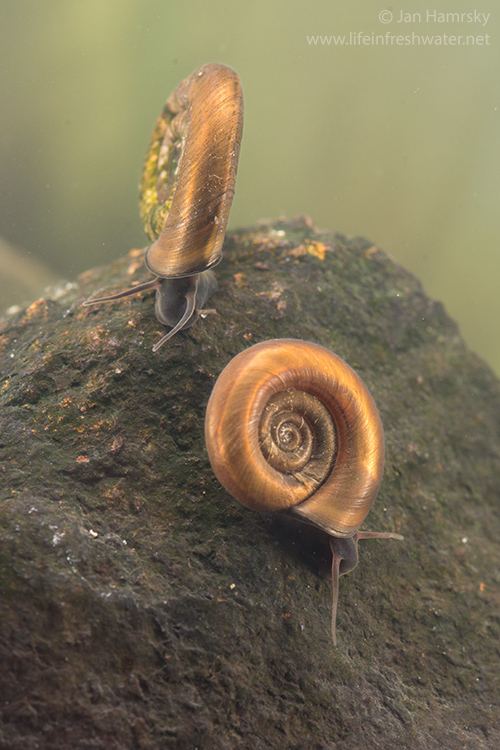 Freshwater snails are divided into two major groups, depending on how they breathe. 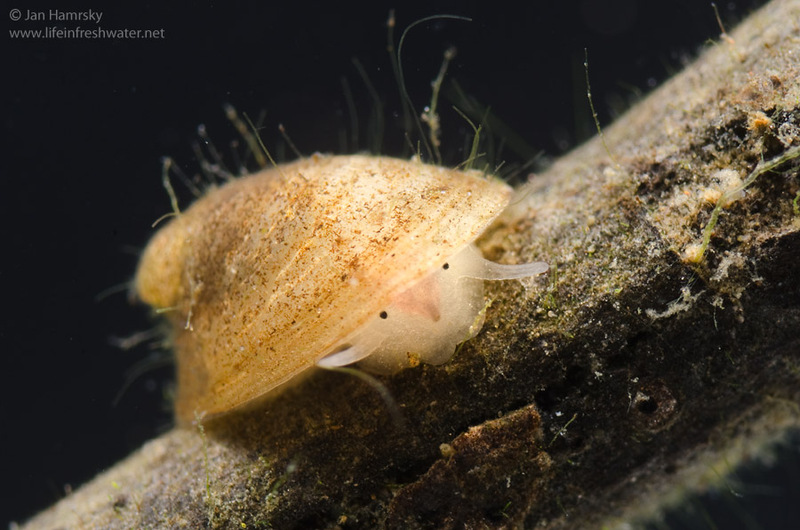 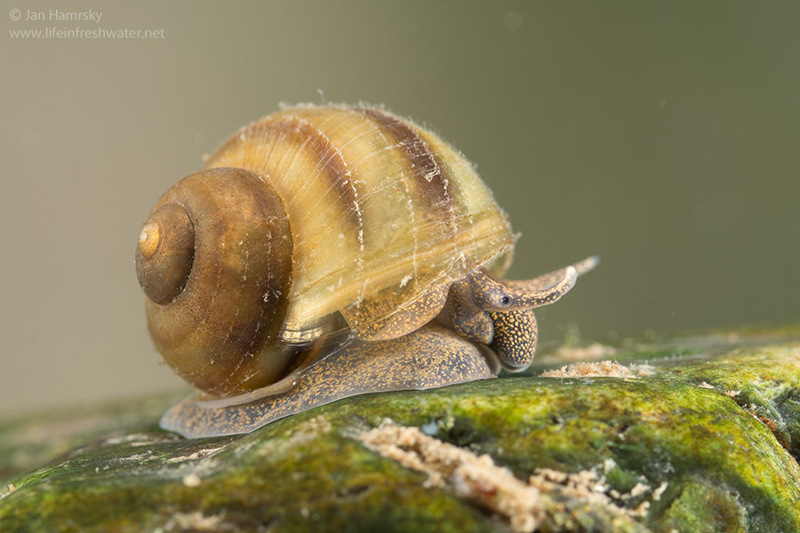 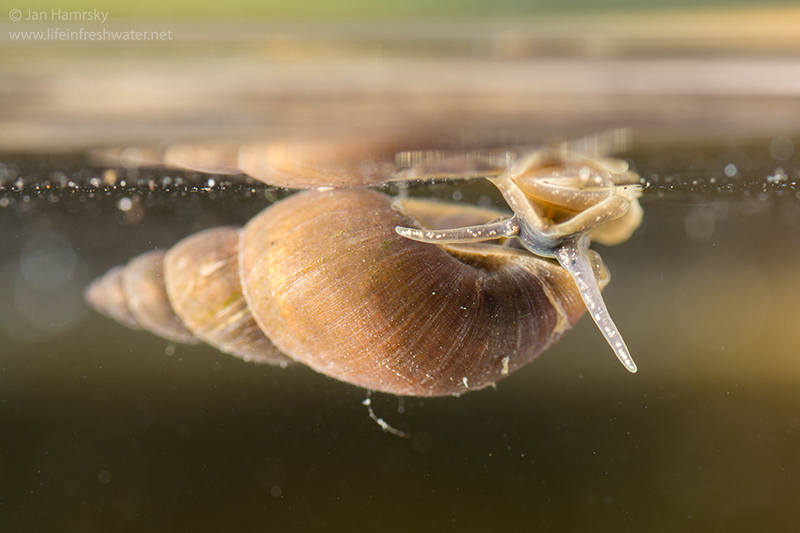 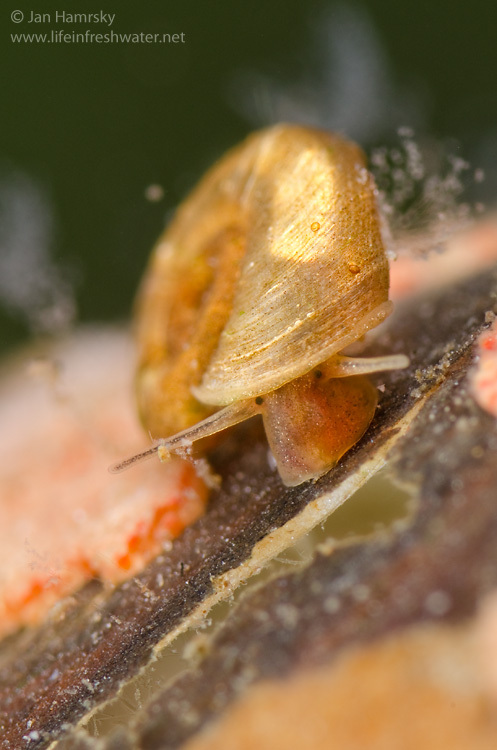 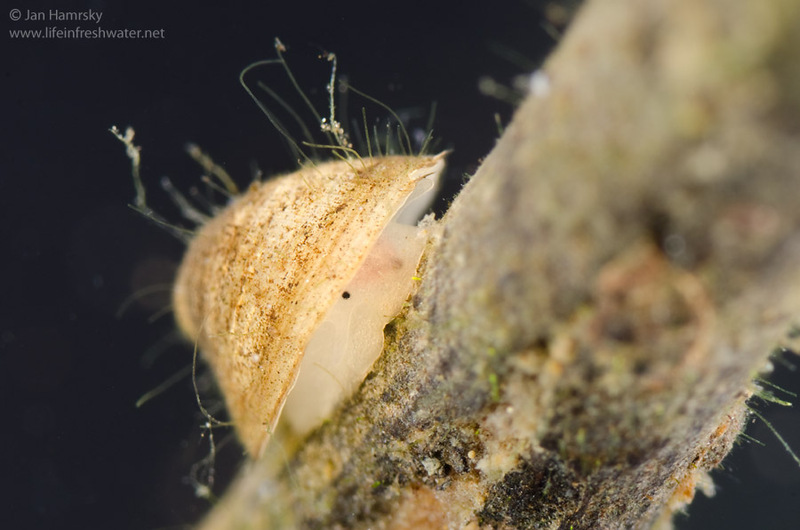 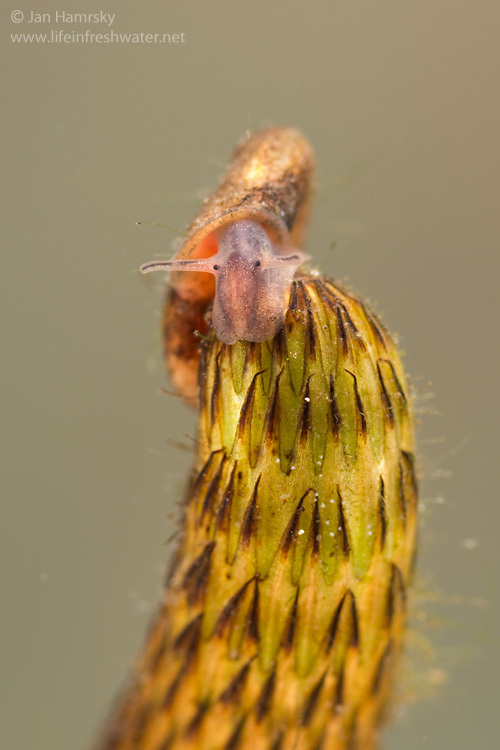 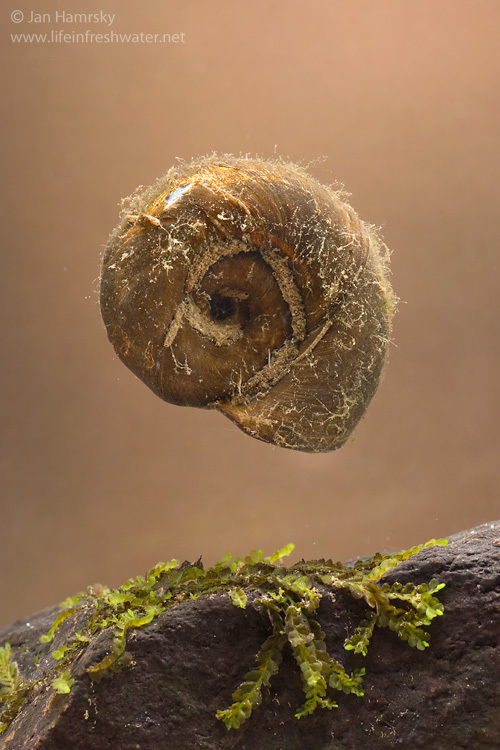 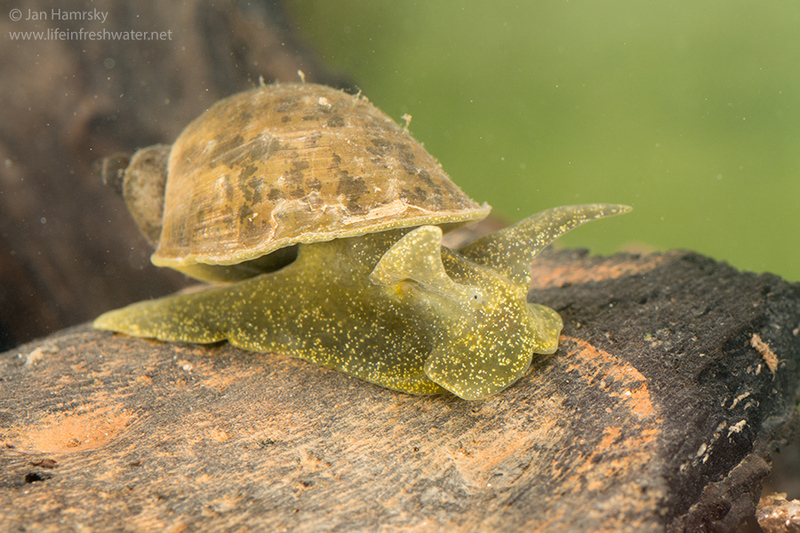 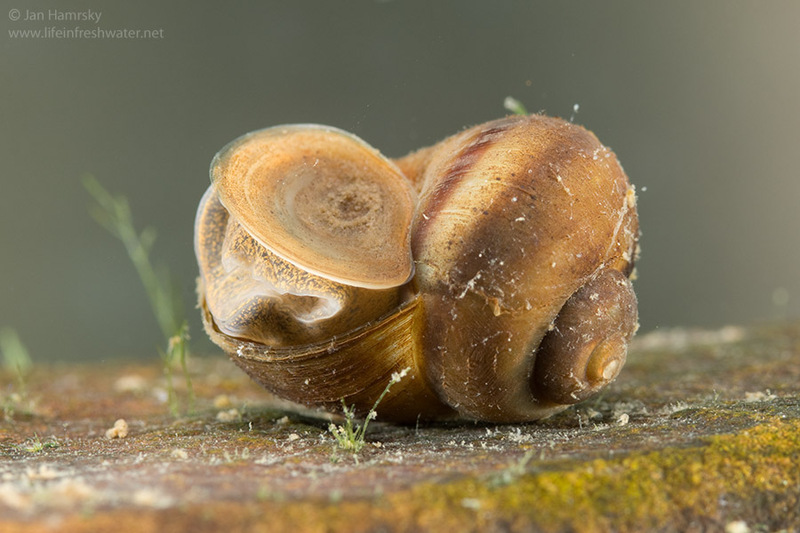 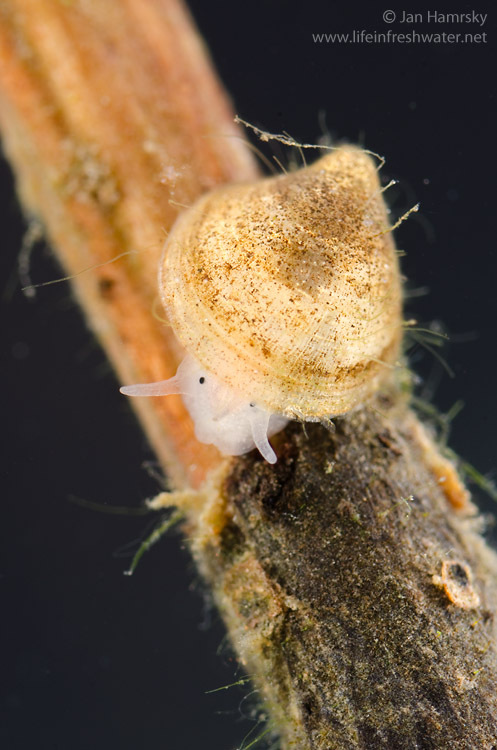 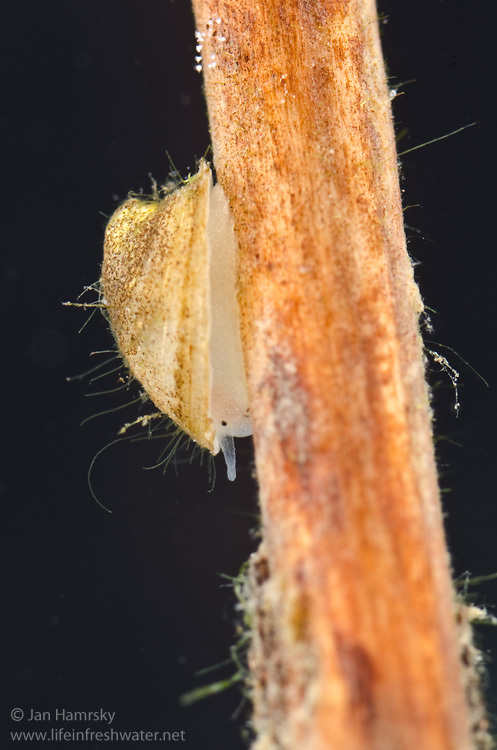 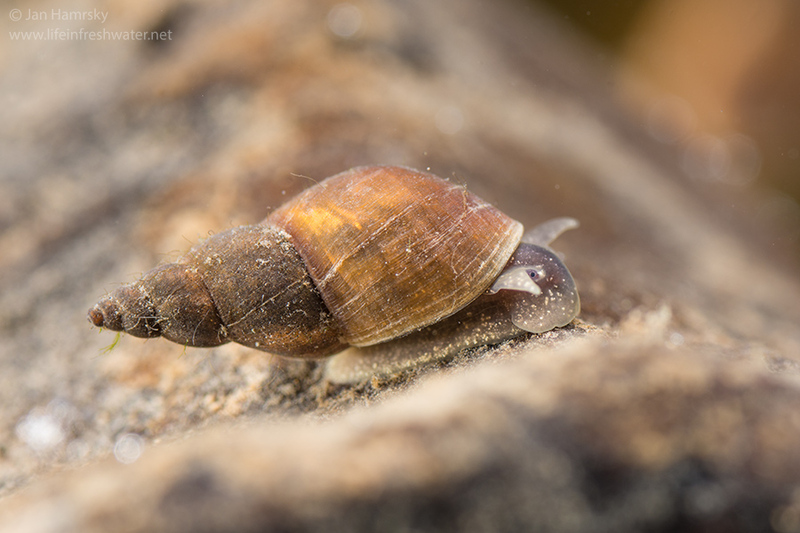 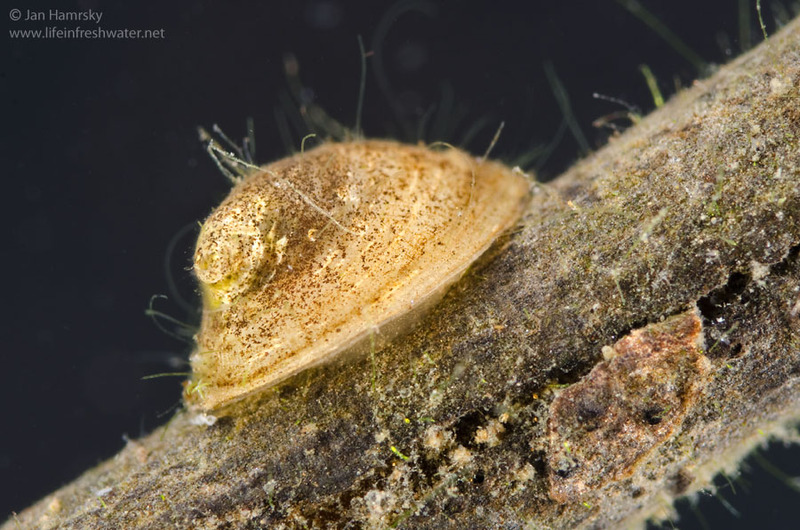 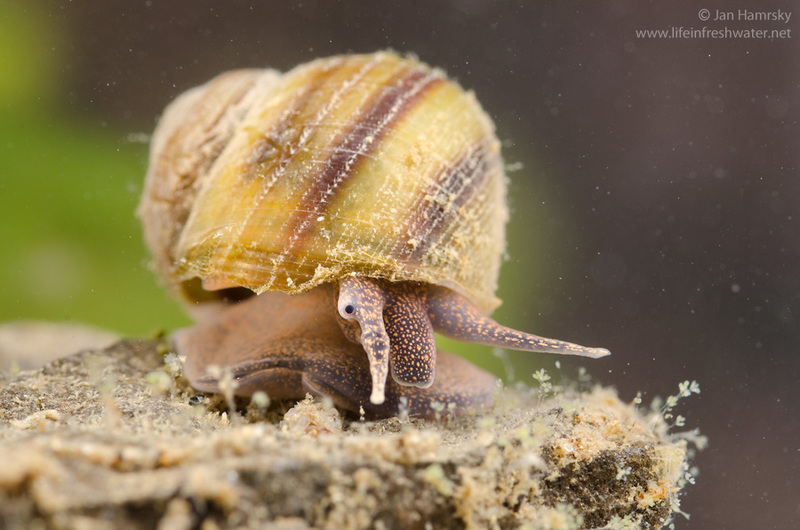 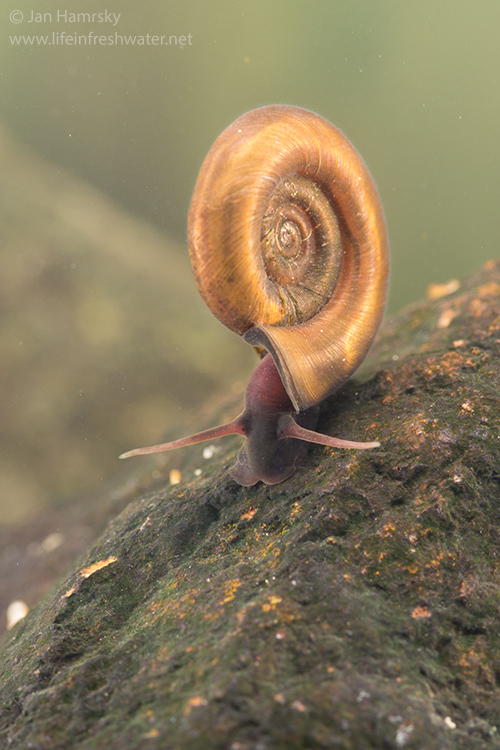 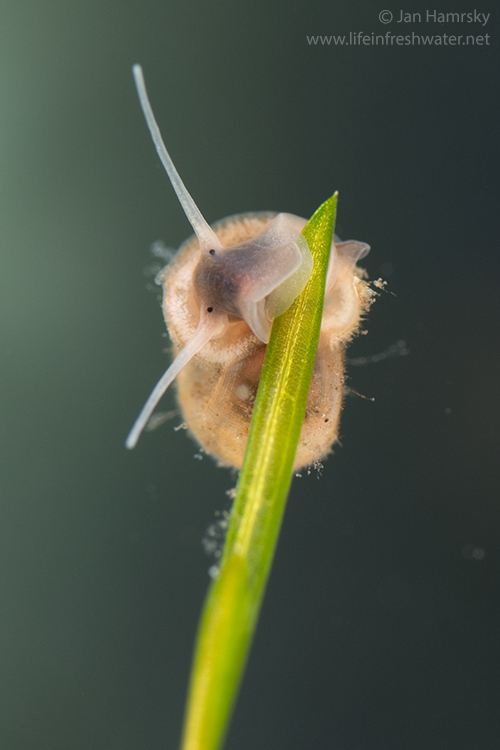 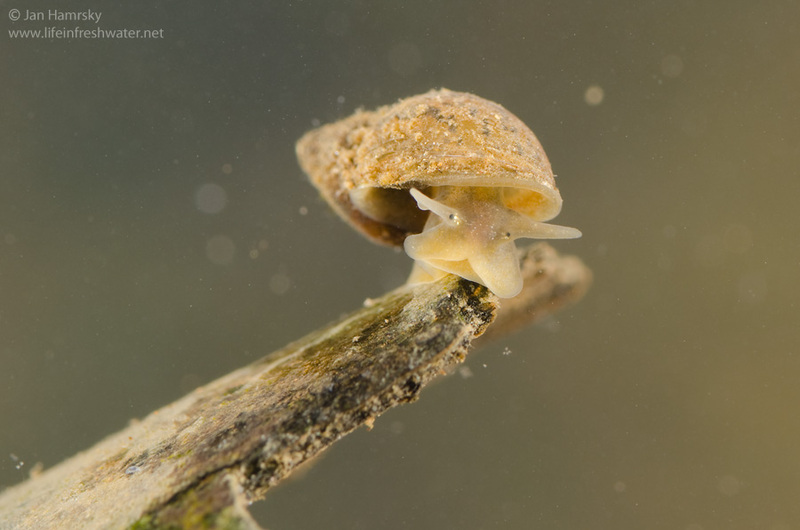 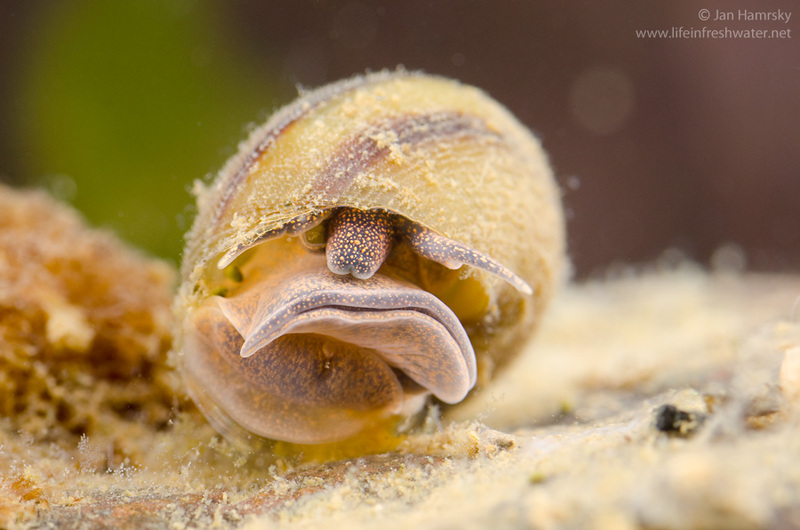 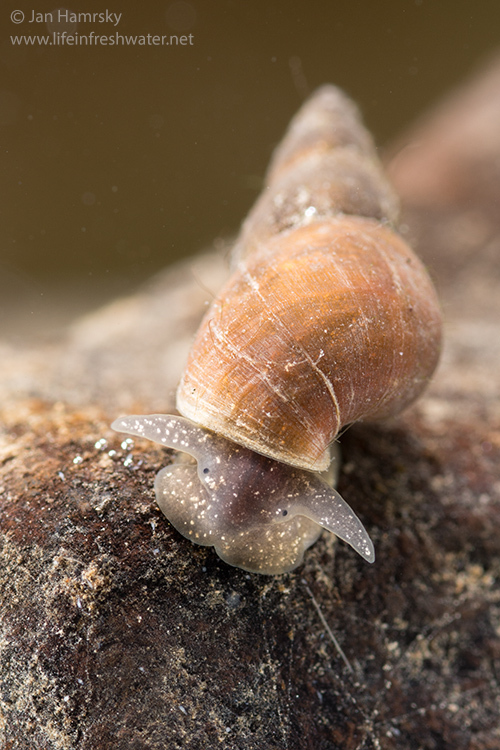 Gilled snails (subclass Prosobranchia) let the water to enter the shell and use their gills to obtain dissolved oxygen directly from the water. 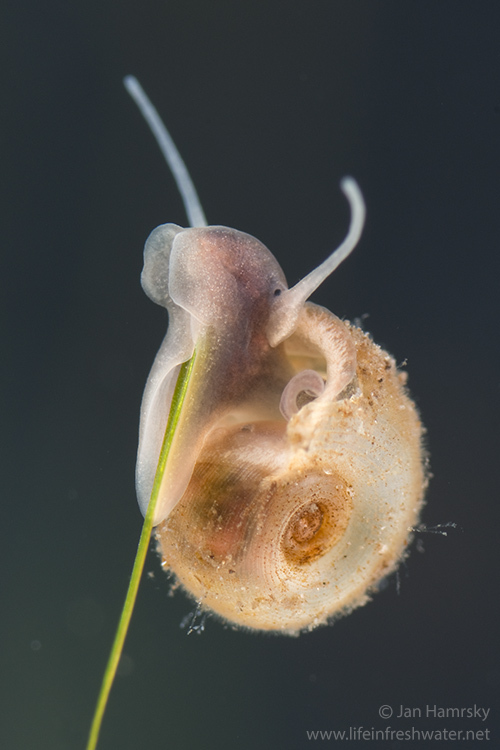 On the other hand, lunged snails (subclass Pulmonata) have a body cavity, where the air is stored. 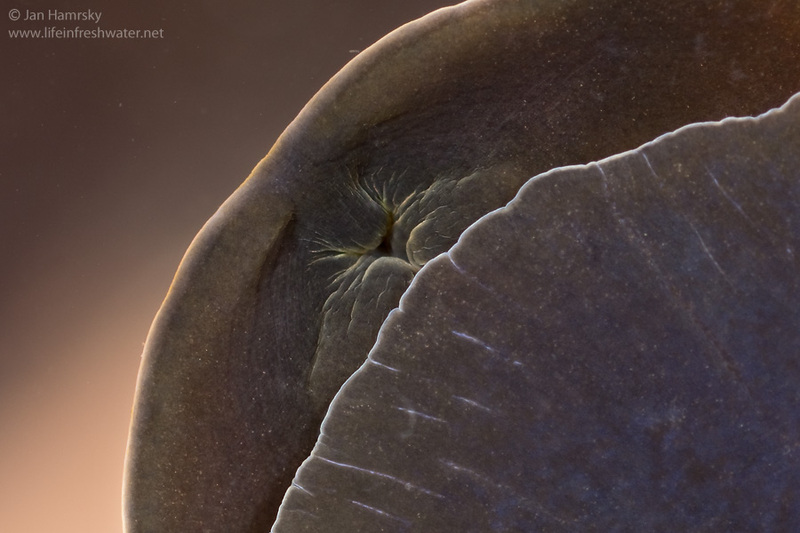 This structure works much like a lung. 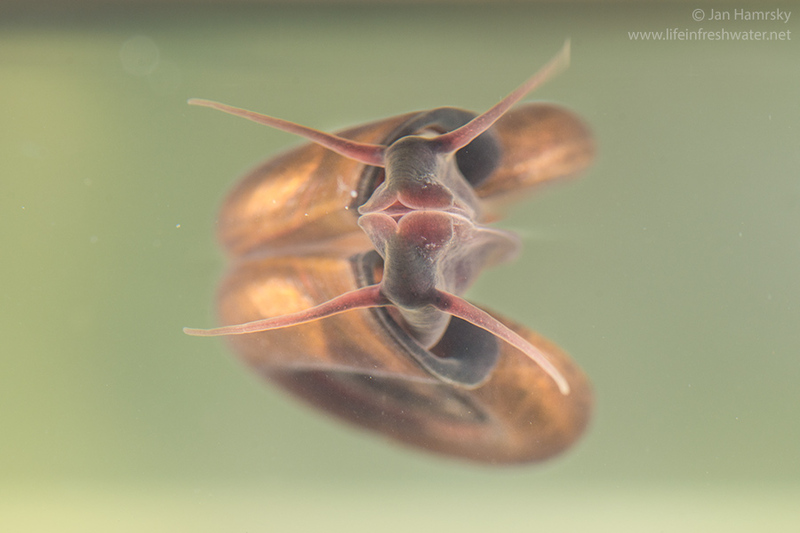 The oxygen is transferred into the body through thin tissue around the cavity. 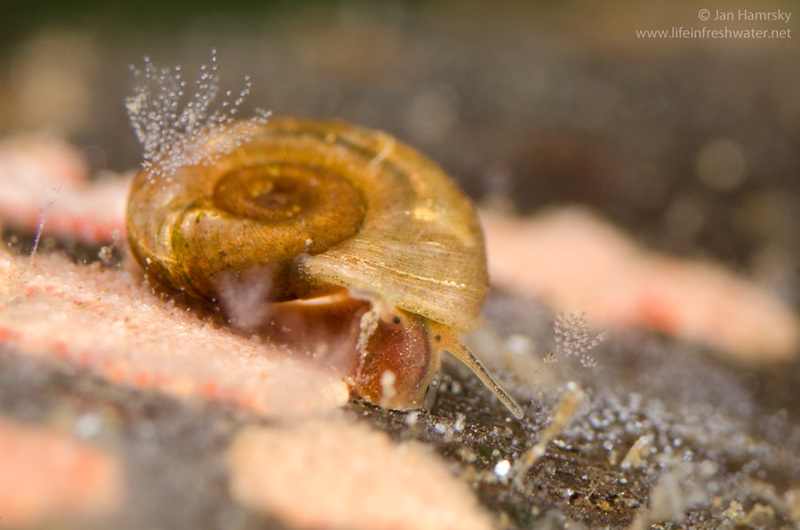 Time to time, plumonates must return to the surface to replenish the air supply. 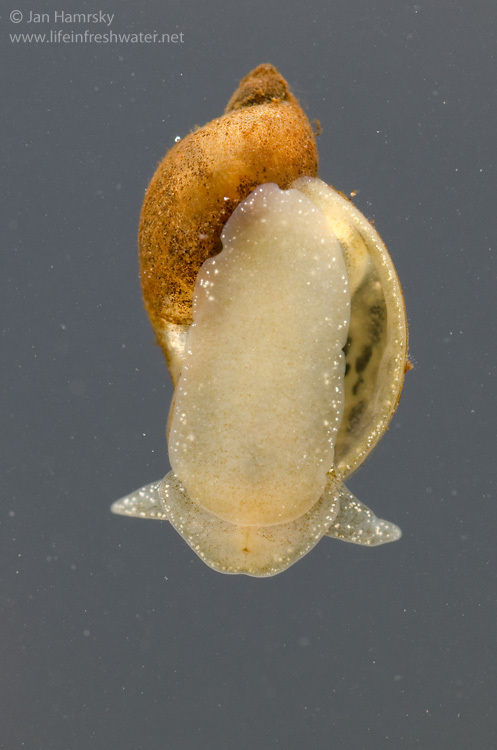 The body is not distinctly separated into segments, but organized into irregular sections: head, visceral mass, mantle and foot. 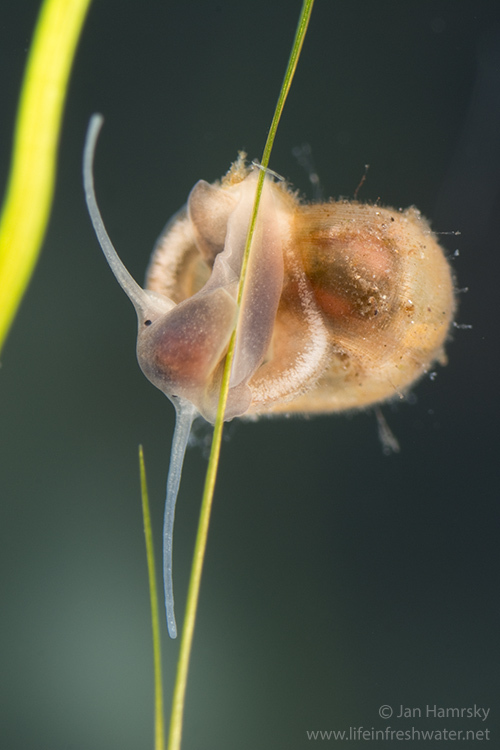 The head bears a pair of tentacles (terrestrial snails have two pairs of tentacles), a pair of small eyes and mouth. 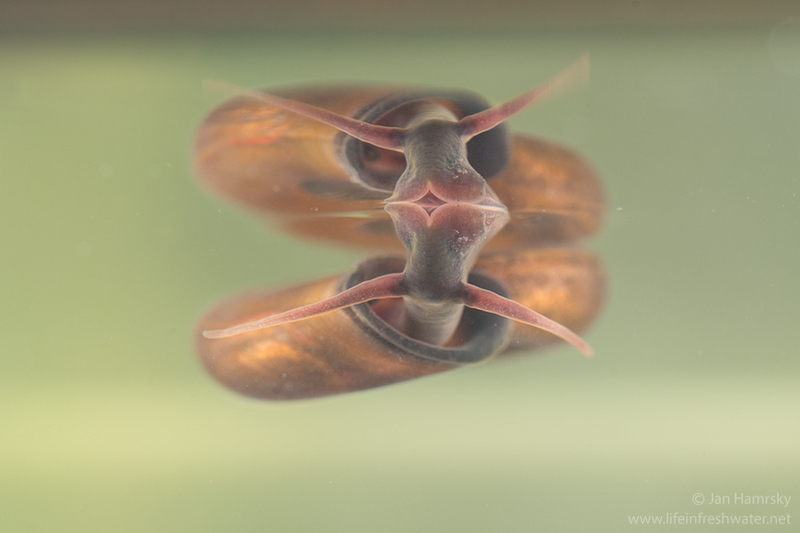 There is a rasp-like structure inside the mouth called radula. 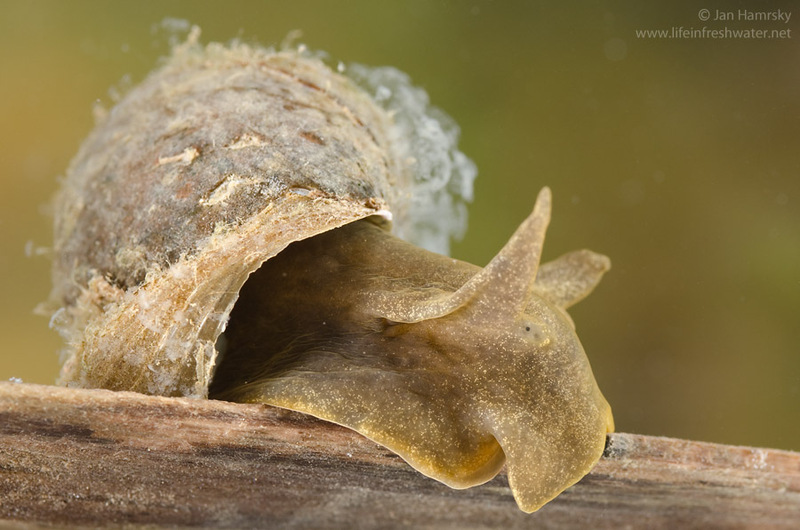 Radula is covered with many small teeth, which are dragged along the substrate and then drawn back into the mouth. 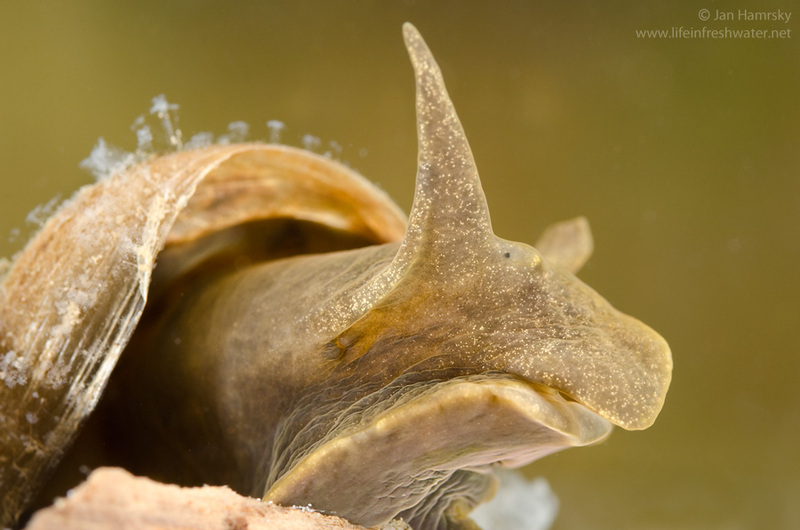 Visceral mass, the largest part of the body containing all the internal organs, is permanently hidden in the shell. 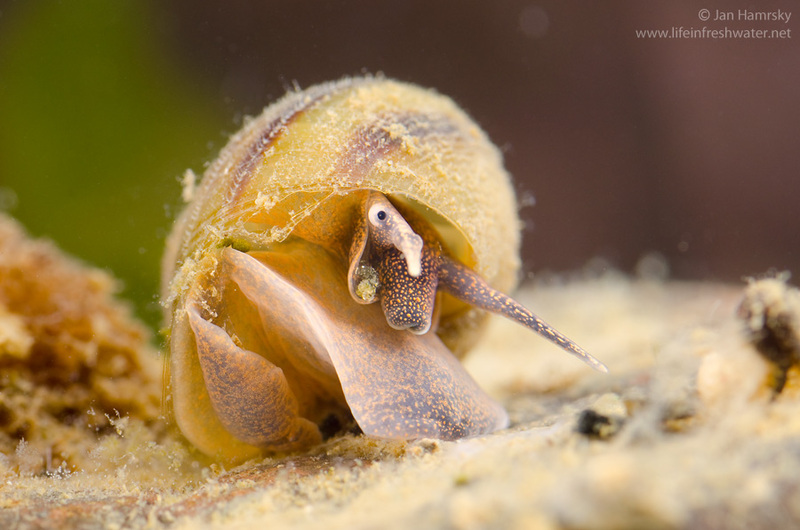 The body is covered by the layer of soft tissue called the mantle, which secretes calcareous material composing the shell. 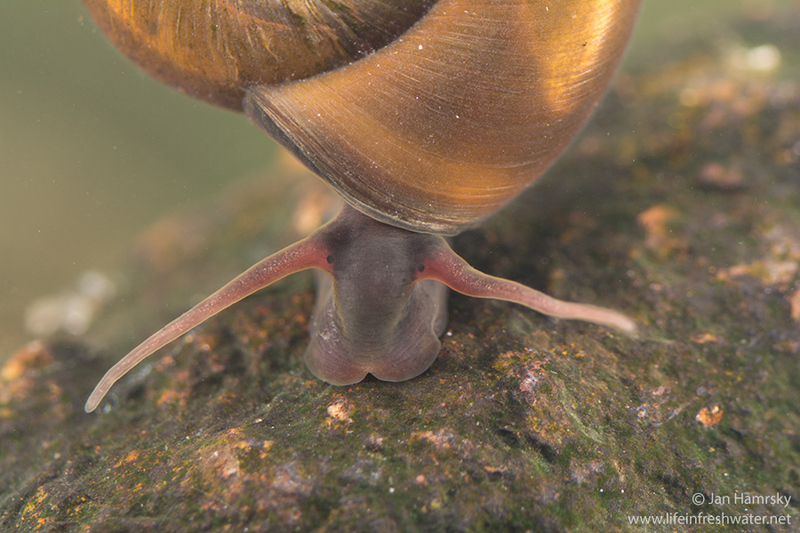 The muscular foot projecting from the shell is used for movement. 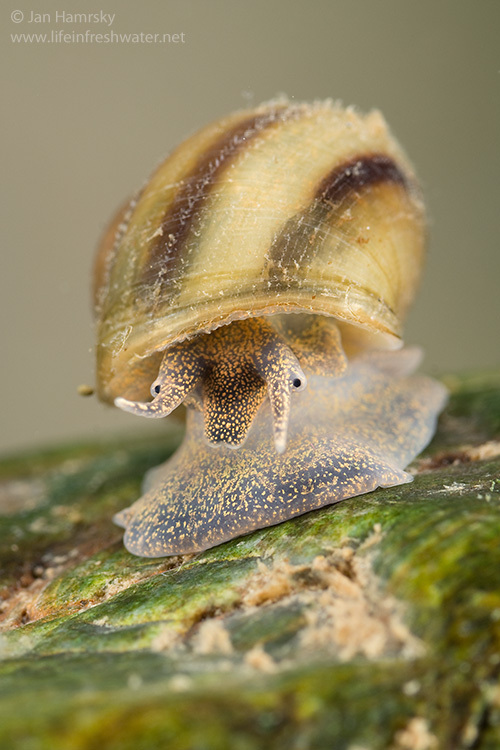 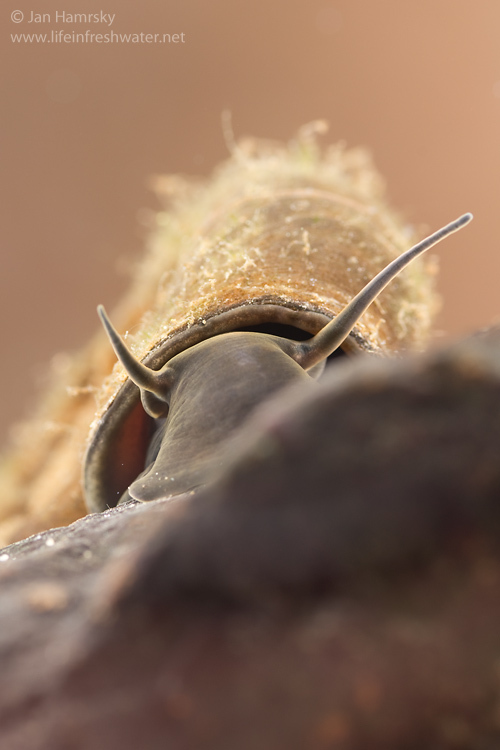 Snails glide on a thin film of mucus, which is secreted from the underside of the foot. 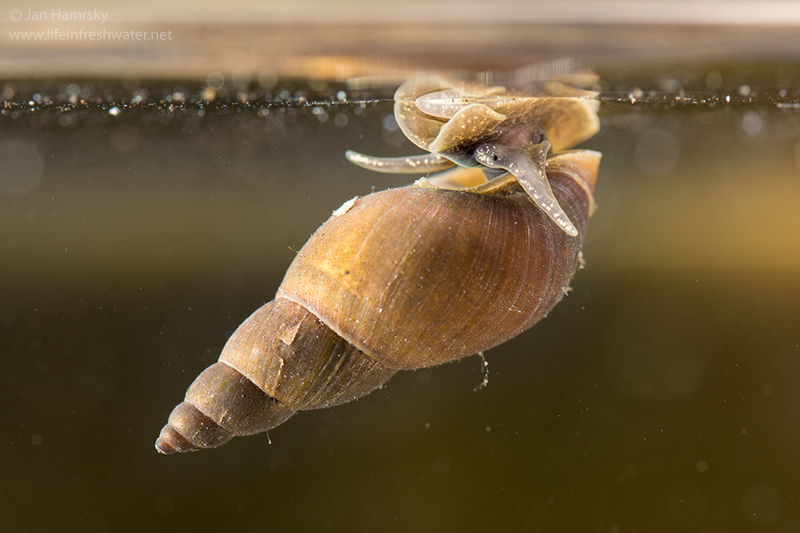 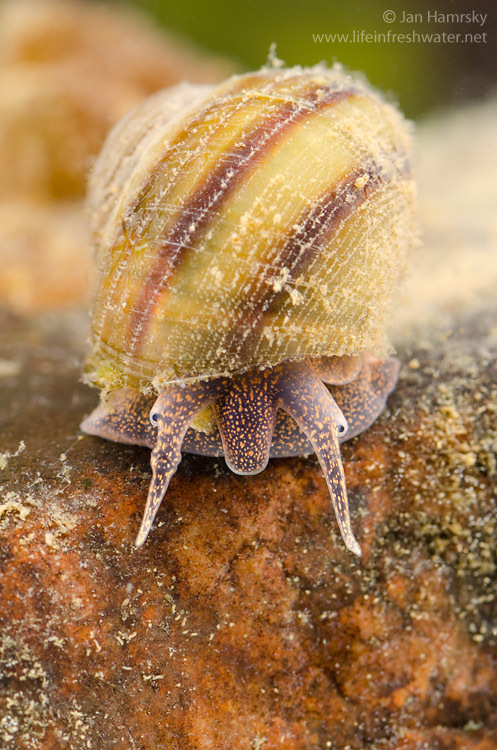 The gilled snails have a hard flat plate (operculum) attached on the rear of the foot. 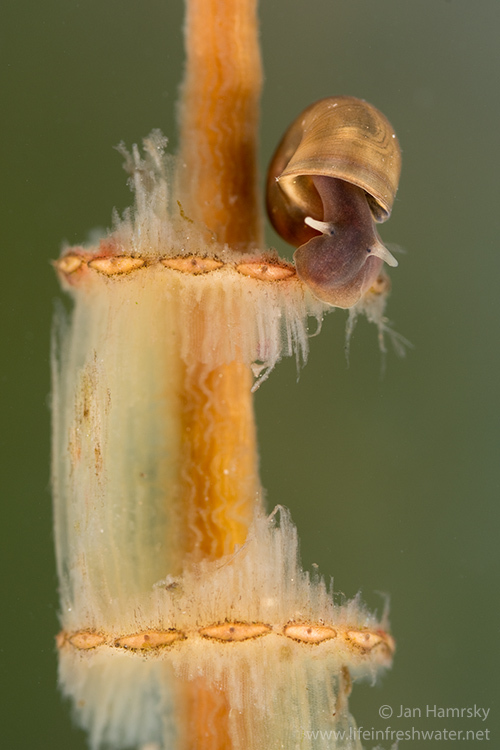 If needed, snails withdraw the head and foot into the shell and seal the opening with the operculum. 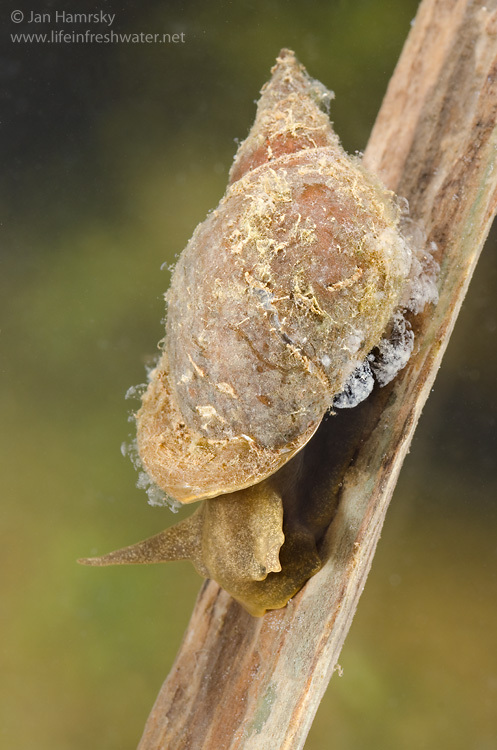 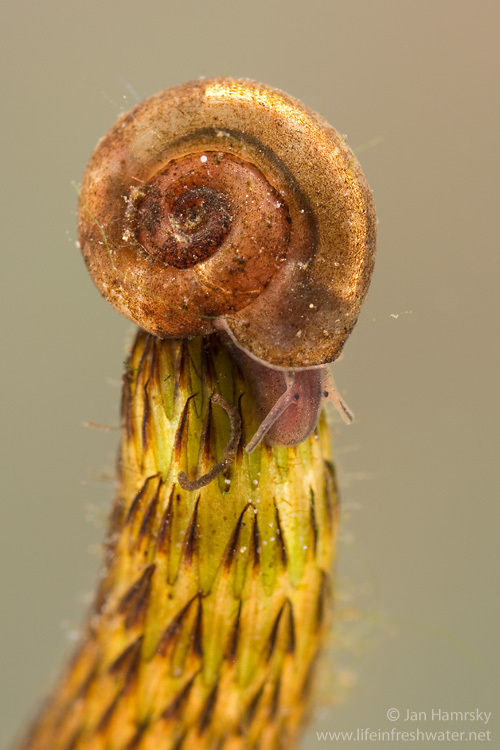 Most gilled snails have separate sexes, while most lunged snails are hermaphroditic. 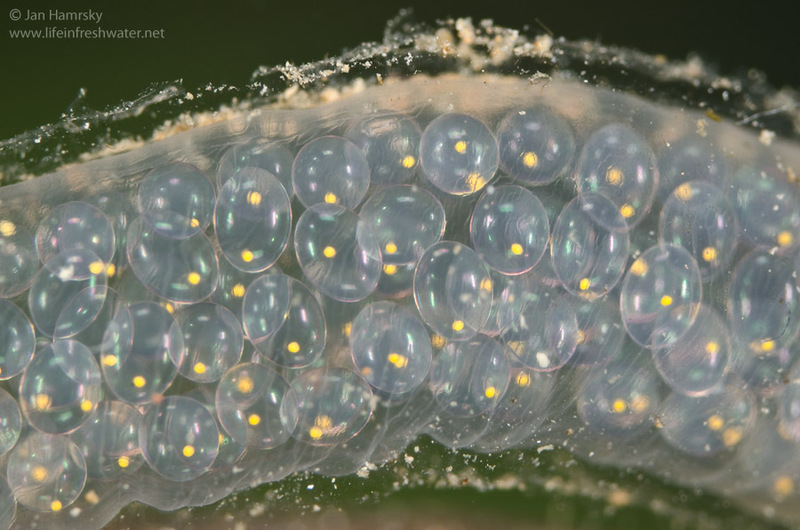 Eggs are usually laid in gelatinous masses and attached to various submerged objects. 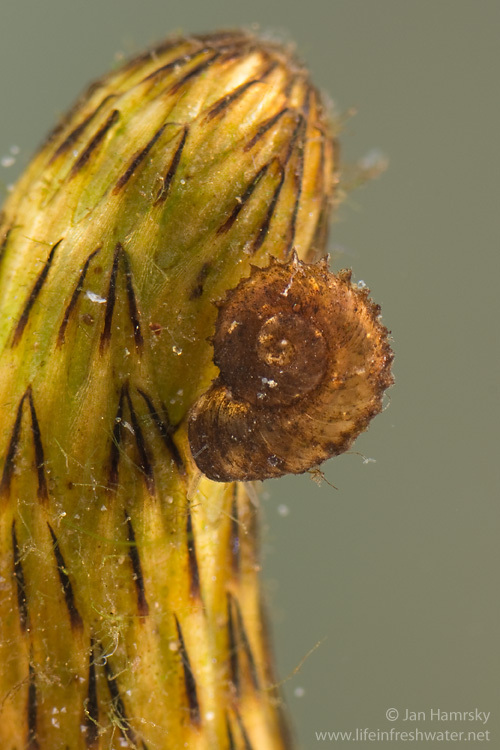 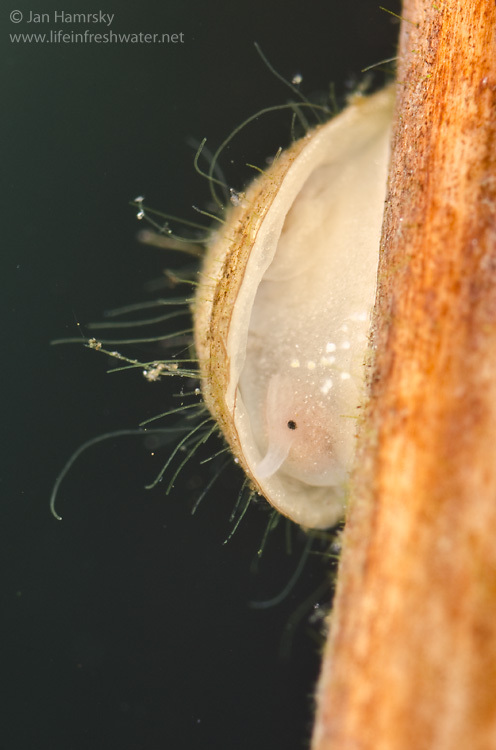 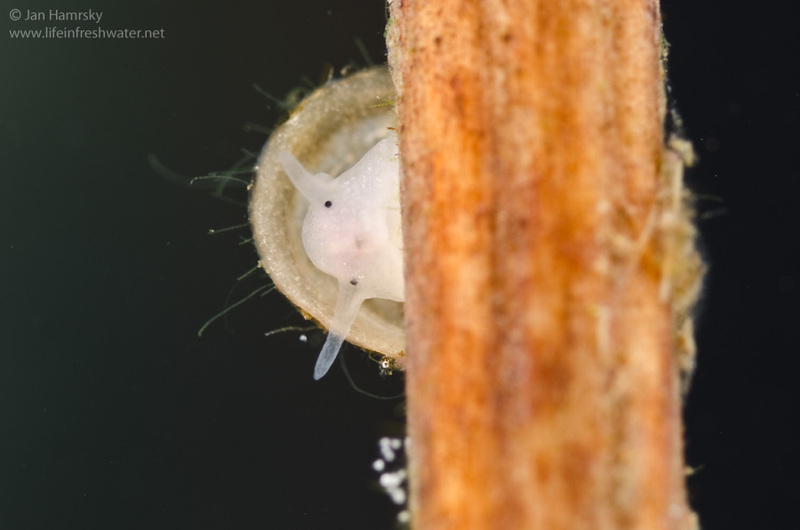 Freshwater snails develop inside the egg mass and hatch as tiny snails with the slightly coiled shells.